Just as pyramids in Giza hide an eternal secret, sales also hides a secret and a mystery – how to sell an exclusive solution. What is the thing that takes us to a decision while shopping, this or that brand of chewing gum, these or those shoes, this or that dish, this or that service? Pieces of the puzzle are there, it’s just that each of us has to make a perfect image. Image which precisely shows their wants and desires. Successful negotiations largely depend on whether we are able to communicate the vision of our world to the person with whom we are negotiating, who has a completely different vision. These skills are also used in everyday life, but they have become key factors in the world of business and sales. There is a long process from preparing for a meeting to closing the deal. Complex. It requires steps, details, patience and listening. In fact, here we are going to talk about human behaviour, we are going to study the way people think, fight prejudice and solve problems together. Sales is not a template, there is no script for it, and no one who is considered a good salesman will ever carry a reminder on how to sell. That person will constantly think of people and how the human brain functions. He/she will always try to find the best possible solution to everyone’s problems. Of course, with mutual benefit in mind. In life, as in the process of successful sales, there is no extortion or compromise, manipulation or lies. There is only predictability. The skill to predict what the seller is going to tell us and how he/she will react. More or less through experience and learning you will notice that all the sellers are the same, as are all the customers. Try a different approach, be aware that you are sitting opposite a person who can give you the key to your puzzle. If you succeed in persuading that person, you will also reveal all of his/her secrets. There is no free advice, and there shouldn’t be. Instead, there is possibility to reach solutions and answers together. At my initial meetings, at the end of my speech I would offer the clients contracts containing all of the elements that would benefit my company. I thought that every good sale required that you point out the value of what you are offering, and that the benefits of the product or service will be the selling point. 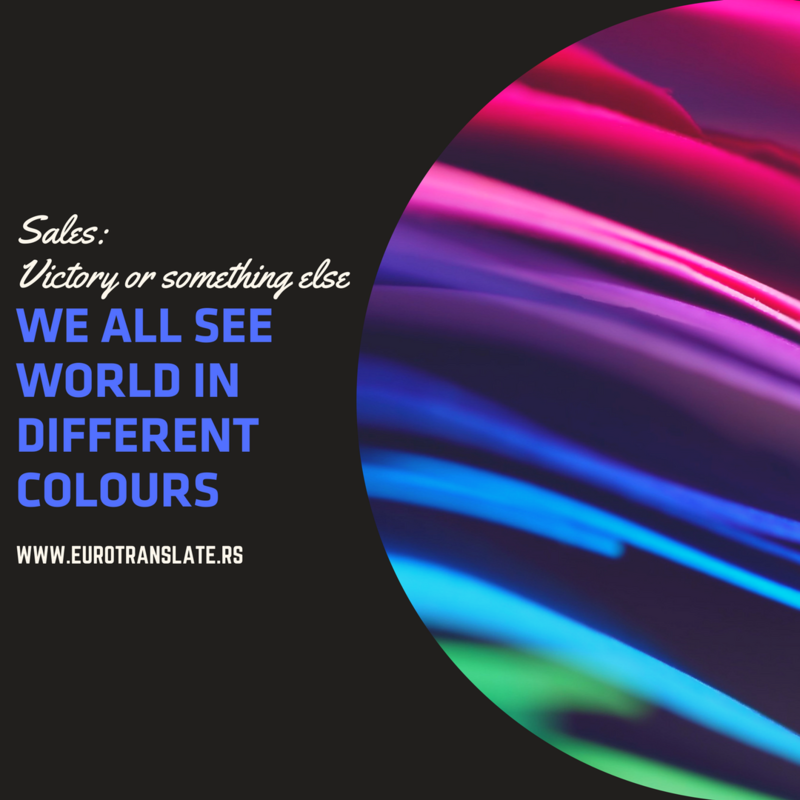 A meeting that I had last winter at a b2b conference in Vienna, as a sales representative of the Eurotranslate translation agency, is a great example that you should not reveal everything at the beginning. On that occasion, I have immediately offered the client all of the bonuses and discounts, but I have not persuaded them that what I offer is what they want. Every customer has doubts, and this is the point in the negotiations that leads to extortion and asking for even bigger discounts and bonuses. I hadn’t been focused on what they really need, but selfish in every way and trying to get what I wanted. This ended with them trying to cut our service prices by half, while quoting the alleged pricelists of other agencies, as well as the benefits that they offer. This is a good place to mention my first sales coach, as it is called today, but I would rather call him a life coach. Mr. Dragan Vojvodić succeeded in explaining to me something that has been bothering me for a long time, why all the clients keep asking for our offers and they love our terms and prices, but then they take them and we usually never hear from them again. They take your offer and the bonuses, as well as your pricelist, and go to your competition and try to extort better terms, lower prices, etc. Do not be too quick to reveal everything that you have to offer, without first listening to the person you are selling to. You can succeed only by understanding the needs of your clients and fulfilling them. Another important part of communication are emotions that we show, as well as our expectations. To expect all or nothing, halfway or little. To expect losses or wins isn’t realistic. Real is only the process through which we must go, as well as the effort and emotions that we have to put into making something happen. You have probably noticed yourself that when you expect something out of someone or a situation in advance, the disappointment is much harder to bare. The emotions that we have to show should never jeopardize ourselves, or be at the level that will interfere with our common sense which will, rationally, give the best answer. There are many problems with communication that we as a civilization are facing today. The possibilities to resolve them and eradicate them forever lie in understanding of the human psyche. It is not uncommon to read on the Internet that some of the best sales persons have diplomas in the fields of sales/marketing and psychology. Answers to many questions still lie in ourselves, so you won’t be able to purchase a magic formula for successful sales, or buy a book that will change your life. You can only always learn, listen and try your best to understand. For everything that is unclear, ask again or ask for a confirmation of what you heard, so that you don’t make arbitrary conclusions in the future. In the next article I am going to write about the steps in the process, and how to prepare for good communication in a business meeting. Gordana Đorđević was born in 1981 in Niš where she graduated from the Department of Tourism and Geography at the Faculty of Sciences and Mathematics. She found herself in the world of sales and marketing by accident, and previous experience in direct communication with numerous travellers helped her fit in faster. She took several courses in sales, as well as a school for PR managers. She has been writing since she was six years old, and is working on her first novel which will be published by Laguna. She lives in Belgrade and she is the mother of two small boys. 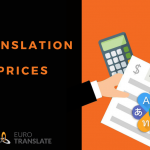 Eurotranslate translation agency, which has successfully operated in Serbia for 11 years, offers services of written and oral translation in various fields. We offer translation services from all European and world languages into South Slavic languages and vice versa. 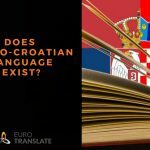 We specialize in the Serbian language and other Balkan languages. We pay special attention to the needs of our clients and develop close relationships with our clients, which allows us to maintain successful cooperation for many years. In 2015 we also established a Life Sciences Department which is dedicated to medical translations, and the translation of medical documentation. 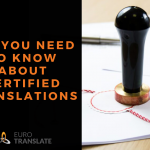 In cooperation with the best MDs from all the fields of medicine, we are able to elevate this kind of translation to a new level.